Countless people have looked at the moon and seen, in the light and dark regions of its surface, some sort of human face (or else a full human figure). The Man in the Moon is observed all over the world, in both the northern and southern hemispheres, but the faces people see are not the same. One person sees an eye where another sees a mouth, and the face will never have an official map. No-one, as far as I know, has ever formally researched how many versions of the Man in the Moon are seen around the world. 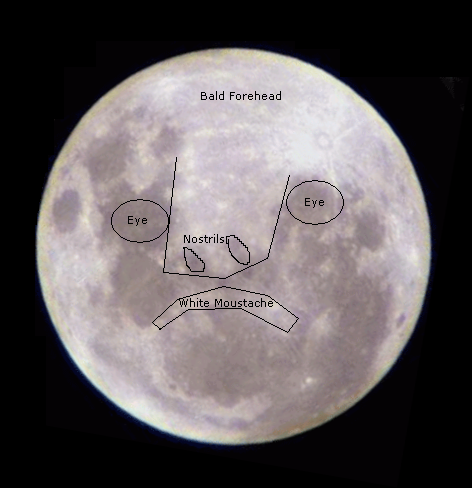 Most illustrations show a version recognised in the Northern Hemisphere, but in Australia we see a face at least as readily, even though we look at the moon from a different orientation. In this blog post I’ll describe the face as I’ve seen it since I was six years old, adding my part to the very little that has been written from a southern hemisphere perspective. Here is a formal description in terms of recognised names for the lunar features. You can look up the features I refer to between this link for the dark maria and this one for the pale highlands. The highlands represent the figure’s bald forehead and nose, while the maria represent parts of the face in shadow. The forehead is Terra Fertilitatis and the nose is Terra Sanitatis. The nostrils are Mare Vaporum and Sinus Medii. The eyes correspond, more or less, to Mare Tranquillitatis and Mare Nubium. I interpret Terra Niui (extended to Copernicus Crater) as a thin white moustache. The mouth is in the vicinity of Mare Ibrium (but I do not identify it with Mare Ibrium, as I consider the region to be in shadow). Below are two illustrations, which between them should clarify the details. Just to show I’m not the only one, here is a blog post written by another Australian, which agrees broadly with my interpretation of the face. There are differences in detail, but that’s to be expected. A survey would make a great sociological research project. My mother, when she was young, was taught to see the king “in his counting-house, counting out his money“. I don’t know whether or not this interpretation of the moon’s features is original to her family. As a child, I pointed out to Mum that actually it looks like a snail. She was instantly converted, and royalty was replaced with a gastropod. The king’s crown corresponds with the snail’s stalks, and the big pile of cash corresponds approximately with its shell. I think it’s by Ted Hughes and is called ‘The Snail of the Moon’. Same here in South Africa. Never understood the northern hemi version. To me I’ve always thought our southern moon-face looked like more of a seal’s face. Same placing of eyes, mouth and stache but think whiskers instead. ARF arf!